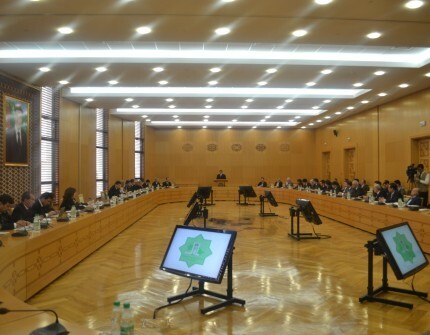 On the 6th of March 2019, a briefing was held in the premises of the Ministry of Foreign Affairs of Turkmenistan in participation of the representatives of national and international mass media, as well as the representatives of the embassies and international organizations accredited in Turkmenistan and was dedicated to achievements of Turkmenistan in the spheres of sustainable transport as well as water and energy diplomacy. The Deputy Chairman of the Cabinet of Ministers of Turkmenistan, Minister of Foreign Affairs R.Meredov, Permanent UN Coordinator in Turkmenistan E.Panova, Head of the OSCE Centre in Ashgabat N.Drozd, Head of the UN Regional Center for Preventive Diplomacy of Central Asia N.German, as well as the Ambassadors Extraordinary and Plenipotentiary of the Republic of Korea, Republic of Uzbekistan and Ukraine made addresses at the briefing. In his speech, the Minister of Foreign Affairs noted that in 2015 during the Global Water Forum in South-Korean city of Daegu, the President of Turkmenistan raised the issue of establishing new diplomatic course – water diplomacy. And in September 2018, during his address at the 73rd Session of the General Assembly of the United Nations, the President of Turkmenistan spoke about the actuality of water issues from the point of view of stable development. The participants of the briefing were thoroughly informed about the achievements of water diplomacy of Turkmenistan. In this context, the significance of constructing the Turkmen lake “Altyn Asyr,” as well as the important activities of Turkmenistan in the framework of chairmanship of Turkmenistan in the International Fund for saving the Aral Sea had been underlined. In his address, Minister especially stressed the role of state policy undertaken in this area by the President of Turkmenistan Gurbanguly Berdimuhamedov. Holding an active position in this direction, including cooperation in the format of UN and other authoritative international organizations, neutral Turkmenistan considers the realization of water diplomacy aspects as one of the main courses of its external policy actions. In this context, Turkmenistan expresses its readiness to collaborate with all the interested governments and international organizations. Also, the Minister of Foreign Affairs of Turkmenistan specifically noted the tireless care of the President of Turkmenistan Gurbanguly Berdimuhamedov on creating a transport infrastructure in the country as a vital factor of economic and social development. Suitable and secure international corridors with the use of railway, automobile, air and maritime transport are created in the country that will provide for stable development in the region, promoting good-neighborhood relations, as well as will strengthen cooperation and increase the amounts of trade turnover between the countries. As to the energy diplomacy, the Minister noted the significance of large-scale energy projects which serve as an integral part of the state and external policy of Turkmenistan. Based on the initiatives of the President of Turkmenistan, a number of resolutions of the UN General Assembly on stable and reliable supply of energy resources to international markets were adopted. Grand projects on gas supplies to China, as well as the construction of the gas pipeline Turkmenistan-Afghanistan-Pakistan-India (TAPI) are implemented, while currently the negotiations on gas supplies to Europe are intensified. In this regard, the role of recently signed Bucharest Declaration on the “Caspian Sea-Black Sea” corridor was stressed. Underlying the significance of these projects and expressing hope for further cooperation with all the interested countries and organizations, the Minister noted that all the international legal norms as well as the ecological protection are considered during the implementation of all these projects. During the briefing, the Minister also noted that the National Programme of Social and Economic development of Turkmenistan for the period of 2019-2025 was designed in close cooperation with the authoritative international organizations, and is particularly based on the Sustainable Development Goals.